Although there are many homeschool reading programs that help parents learn how to teach their children to read, this is a review of a program that was developed by a dad who taught his children to read at a very young age. Parents shouldn't should make it a goal to have their children reading early, but if the child is ready and the program is solid, then the parent should spend time working with their child. This is basically an ebook along with audios and print outs that were developed by Jim Yang who taught his children to read when they were 2. He did lots of research and seems to have a balanced approach. Phonetic approach that is not focused on memorizing rules. Divided into 2 stages. Stage 1 is 227 pages long and contains 28 lessons with 4-7 steps in each lesson. Stage 2 is 97 pages long with 22 lessons and steps in each lesson. The author tells the parent exactly how to teach, what to say, and provides audio of the proper sounds of letters along with printouts that can be used or written by the parent if they choose. The program teaches through practice. Lessons should be followed step by step and in order. Everything you need to teach your child to read is included. Students master each lesson before moving on to the next. Students learn the letters necessary for common words first. Students start reading real words early in the lessons. Review is built into the lessons. The sentences that the students read are fun and interesting like "Flip the ham in the pan." Parents can contact the author by email if they have any questions. No negatives were noted. Everything is covered and the author encourages the parent not to push the child and tells the parent exactly what they need to know. Check out this video below for the full explanation of how this program works complete with video of 2 year old reading! How Long Will it Take to Teach your Child to Read with homeschool reading programs? The lessons and steps can take as much time as the parent wants. There is no timeline, just steps that help move your child towards reading on their own. The author encourages parents to use 3-5 minutes 2-3 times a day. This program doesn't take much time each day and doesn't require the child to have a very long attention span either. When looking at homeschool reading programs like this one where 2 year olds learned how to read, parents can be skeptical that students are being forced into something that is beyond their ability. Mr. Yang has simply laid out what he used with his children and put it into a format that any parent can pick up and use. 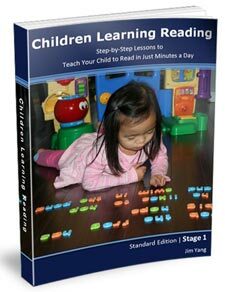 Mr. Yang might or might not be a homeschool parent, but this program certainly ranks up there with some of my favorite programs on how to teach children to read. While there are other systems out there, Children Learning Reading and homeschool reading are the only ones that I can recommend.